July 4, marks the fiftieth anniversary of Philippine independence from the United States. You might think Filipinos would be dancing in the streets. After all, when the Stars and Stripes were lowered at Manila's Luneta Park on this date in 1946 and the Philippine flag rose in its place, a rain-soaked crowd of 400,000 cheered wildly and church bells clanged throughout the archipelago. Speaking to the assembled throng, Senator Millard Tydings of Maryland called the day "one of the most unprecedented, most idealistic, and most far-reaching events in all recorded history." Hyperbole notwithstanding, it was a remarkable spectacle: the world's preeminent power voluntarily relinquishing sovereignty over a nation it had acquired 48 years earlier in the Spanish-American War. When one considers the two decades of anti-colonial struggles that exploded throughout Asia, Africa and the Middle East after World War II, the U.S. move seems no less extraordinary today. Philippine President Fidel V. Ramos has included a July 4 ceremony among an ongoing series of events marking the centennial of the Philippine revolution against Spain. But most Filipinos remain oblivious to the fiftieth anniversary, and many view it with bittersweet emotions. Although Filipinos generally hold the United States in high regard, many of those who have focused on the July 4 anniversary think of it as the Independence Day that wasn't. Philippine historians rightly point out that the U.S. gift of independence in 1946 came with numerous strings attached. They note that the U.S. retained sovereignty over dozens of military bases, and that independence was linked to legislation passed by the U.S. Congress which was designed to insure that the Philippines would remain a virtual economic ward of the United States. The Bell Trade Act prohibited the Philippines from manufacturing or selling any products that might "come into substantial competition" with U.S.-made goods and required that the Philippine constitution be revised to grant U.S. citizens and corporations equal access to Philippine minerals, forests and other natural resources. As Americans relax around their barbecues this Independence Day, we might consider how our own forefathers would have reacted had such a provision been demanded by Britain as part of the 1783 Treaty of Peace held in Paris ending the Revolutionary War. The terms of the Bell Act were so onerous that even the U.S. State Department opposed them. One official described the law as "clearly inconsistent with the basic foreign economic policy of this country" and a betrayal of "our promise to grant the Philippines genuine independence." But the incipient island republic had little choice but to accept the extortionist terms of its sovereignty. The war had left Manila in ruins and much of the countryside laid to waste. Federal coffers were empty, people were starving, and the U.S. Congress was threatening to withhold rehabilitation relief unless the Bell Act was ratified. The Philippine Congress grudgingly obliged on July 2, 1946. 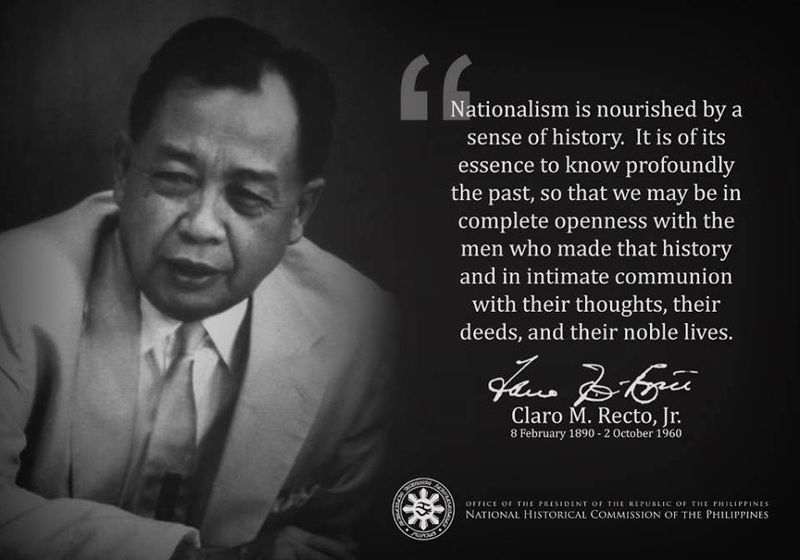 Filipino nationalists were never happy about the annual July 4 holiday with its bands and parades, and in 1962 they prevailed upon President Diosdado Macapagal to change the date. Dr. Samuel Tan of the National Historical Institute says Macapagal was trying to boost his own standing with the nationalists and was "looking for something to rally people that were associated with our revolutionary identity, rather than our colonial identity." (July 4 was briefly retained as a national holiday -- renamed "Philippine-American Friendship Day" -- but has since been abandoned.) Macapagal moved the date to June 12, which, like our own Independence Day, commemorates a declaration of independence: that of Filipino revolutionaries who in 1898 proclaimed their freedom from Spain. The big difference is that the Filipino declaration didn't lead to independence. This does not necessarily diminish its significance. Historians generally agree that the Philippine revolution, the first Asian uprising against a foreign imperial power, would have eventually triumphed over Spain had it not been for the short-lived Spanish-American War, which saw the Americans elbow aside the Filipino revolutionaries. Once victorious, the Americans purchased the islands for $20 million and set about colonizing them. Memories of the American usurpation of their revolution and of the events that immediately followed made the idea of a July 4 national holiday particularly distasteful to Filipino nationalists. In 1898 President William McKinley had declared the U.S. mission in the Philippines one of "benevolent assimilation." But within weeks of McKinley's remarks, American troops embarked on a bloody campaign to stamp out an indigenous independence movement that would ultimately cost somewhere between 200,000 and a half-million Filipino lives. Mark Twain called the Philippine-American War (known by the Americans as the "Philippine Insurrection"), "a mess, a quagmire from which each fresh step renders the difficulty of extrication immensely greater." On July 4, 1901, the U.S. established a civilian colonial government in Manila and made advocacy of independence a crime punishable by a year in prison. The following year, also on July 4, President Theodore Roosevelt declared the Philippine-American War ended, even though freedom fighters, referred to as "bandits" and "outlaws" by the Americans, continued fighting in the countryside for several more years. If you ask Filipinos today when their country finally achieved independence, many say they can't answer the question. Educated Filipinos talk about a process that began with the 1896 uprising against Spain by Andres Bonifacio or the 1898 declaration. Some pay lip service to the July 4, 1946, date, noting its limitations. Others say independence finally came with the downfall of the Marcos dictatorship in 1986. The most frequent answer I received in a series of recent conversations with Filipino academics was September 16, 1991 -- the date the Philippine Senate boldly refused to extend the U.S. lease at the Subic Bay Naval Station. University of the Philippines political scientist Alex Magno says that "psychologically," Filipinos were not free of the U.S. until then. He believes the Senate vote liberated Filipinos from the notion that Washington was responsible for their fate and allowed them to begin thinking of their nation as a part of Asia rather than as an American appendage. "Until 1991, the ghost of the Philippine-American War still haunted us." Vivencio R. Jose, professor of comparative literature at the University of the Philippines, offered a similar perspective. "We declared independence in 1898, established a republic in 1899, but in 1991, a certain part of the cycle was completed." Jose insists that July 4, 1946, was also an important part of this cycle, but that the 1991 Senate vote demonstrated a sense of "self-determination" lacking in the U.S. grant of independence and has thus come to symbolize "the fulfillment of our national aspiration." Today, fifty years after attaining sovereignty, the Philippines is in the midst of an economic and political revival. Subic Bay is one of a half-dozen boom towns that have attracted billions of dollars of overseas investments. Last year the economy grew an impressive 5.7 percent. The country has demonstrated that it can ensure a peaceful, democratic transition from one administration to the next, something that was much in doubt only a few years ago. And Filipinos probably have a better sense of their national identity than at any time since the revolution of 1898 itself. They also have a more acute appreciation of the legacy of American colonialism, not only of the impediments that were placed in the way of development but of the rich democratic traditions as well. Alan Berlow lived in the Philippines for five years where he set up the National Public Radio (NPR) Manila bureau. As a reporter working out of that office, he covered the fall of Ferdinand Marcos and the rise of Cory Aquino. He left in 1992 after Fidel Ramos got elected president. He is also the author of a recent book, Dead Season: A Story of Murder and Revenge on the Philippine Island of Negros (Pantheon, 1996).His article is presented here without editing and is exactly as he sent it. To cite:Berlow, Alan. "The Independence Day That Wasn't" in Hector Santos, ed., Philippine Centennial Series; at http://www.bibingka.com/phg/misc/july4not.htm. US, 17 December 1996.